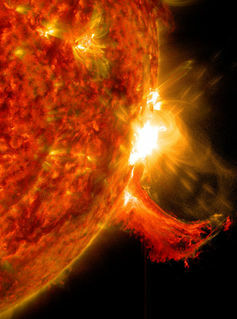 Solar storms start their lives as violent explosions from the sun’s surface. They’re made up of energetic charged particles wrapped in a complex magnetic cloud. As they erupt from the sun’s surface, they can shoot out into interplanetary space at speeds of up to 3,000 kilometers per second (that’s 6.7 million miles per hour). Depending on their direction of travel, these energetic storms can journey past Earth and other planets. If a solar storm makes it to Earth, it can disrupt a variety of modern technologies including GPS and high-frequency communications, and even power grids on the ground, causing radio blackouts and citywide loss of power. It can also wreak havoc within the aviation industry by disrupting communication methods. To combat related potential economic losses, affected industries have been seeking a solution that can provide them with at least 24 hours of warning. With enough lead time, they can safely change their operational procedures. For example, passenger planes can be rerouted or power grid transformers can begin the slow process of “winding down,” all of which require at least a day’s notice – a huge jump beyond the 60-minute advance warning currently common. By building on earlier research, my colleagues and I have come up with a technique we think can meet that 24-hour warning goal. A false alarm issued on January 7 2014 about an unusually large coronal mass ejection underscored the scope of the forecast problem. The strength with which a storm can affect our everyday technological infrastructure depends largely on the orientation of its magnetic field. Often the magnetic field within a solar storm has a helical structure, twisted like a corkscrew. But, much like tornadoes on Earth, these solar storms undergo significant changes during their evolution – in this case, as they leave the sun and travel toward the planets. NASA’s Magnetospheric Multiscale mission investigates magnetic reconnection. With a specific field orientation, the floodgates open, allowing the solar particles to enter the otherwise protective bubble of Earth’s atmosphere (the magnetosphere). This interaction between the solar material and Earth’s magnetosphere is predominately driven by a process of joining each other’s magnetic fields together. This interaction is called magnetic reconnection. North and south attract and combine. This realignment of the field works in a similar way as two bar magnets attracting. 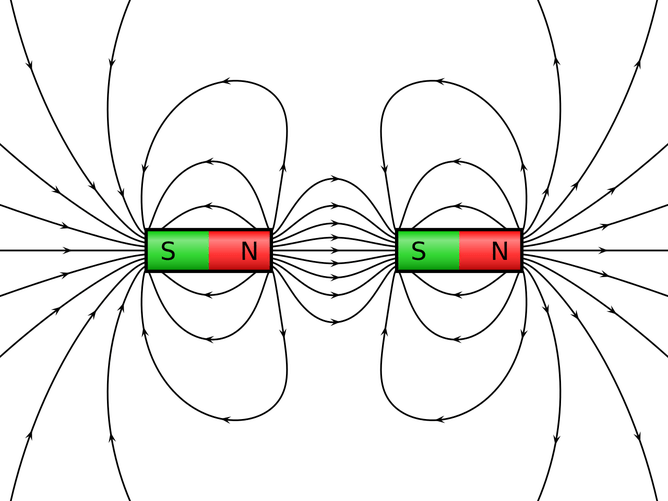 If similar poles of each magnet (north and north) are brought together, the field lines repel each other. Unlike poles attract and combine together. If the poles are unlike, in our case between the solar storm and the Earth’s magnetosphere, they become magnetically connected. This new connectivity of the Earth’s magnetosphere now contains the trapped energetic particles that were previously isolated in the solar storm. 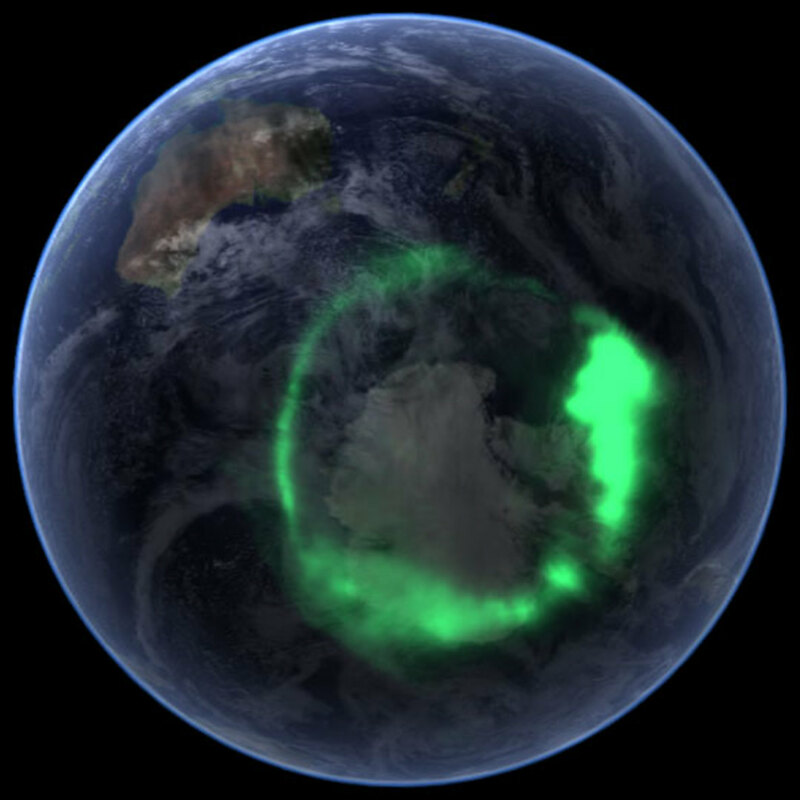 If a large penetration of energetic particles makes it into the Earth’s upper atmosphere, the reaction provides the visual extravaganza that’s often called the Northern Lights. Solar plasma hitting the Earth’s magnetosphere lights up the sky over Antarctica. To date, predicting the magnetic field structure within solar storms hitting Earth has remained elusive. Modern forecasting centers around the world, such as at NOAA and UK Met Office, are dependent on direct measurements from inside the solar storm by a spacecraft just in front of Earth (for example, the newly launched Discvr satellite by NOAA). Measurements tell us the direction of a solar storm’s magnetic field and thus whether it’s liable to reconnect with the Earth’s magnetosphere in a dangerous way for our technology. We’ve been stuck with less than 60 minutes of advance warning. The difficulties in creating a reliable forecast have centered around our inability to reliably estimate the initial structure of the storm above the sun’s surface, and the difficulty in observing how storms evolve as they spend about two days traveling to Earth. My colleagues and I recently published an article in Space Weather that proposes an improved method for predicting the initial magnetic structure of a solar storm. Getting a better handle on the origin of these solar storms is a substantial step toward predicting how the storm can affect us on Earth, and to what extent. Our method relies on correctly modifying a previous discovery about how the motions of solar plasma (of mostly hydrogen ions) and magnetic field hidden below the sun’s surface can affect the initial structure of a solar storm. It’s called the solar dynamo process. This is a physical process that is believed to generate the sun’s magnetic field. It’s the engine and energy source driving all observed solar activity – that includes sunspots and long-term solar variability as well as solar storms. Exploded view of a solar storm flaring out from the sun. We think combining this modified initial storm model with a new method that incorporates a storm’s early evolutionary stages will lead to significant improvements to our forecasting predictions. Triangulating the entire solar storm by using cameras at three locations from NASA’s STEREO and SOHO spacecraft in interplanetary space, using modern modeling techniques we’ve developed, enables a more robust prediction system. Since these cameras are located at very different vantage points in space, we can use them in conjunction to improve our estimations of the total shape and location of the solar storm – much like the depth of field we achieve by seeing the world through two eyes. So far, we’ve tested this new predictive technique on eight different solar storms, with the first forecasts showing significant agreement with the real data. Further advanced statistical testing with a larger number of storms is now under way within NASA Goddard’s Community Coordinated Modeling Center. A burst of solar material erupts out into space. Where’s it headed? We’re working toward improving the user interface and implementation into current systems. Once proven reliable and statistically significant for forecasting, our technique may soon become a regular operational tool used by the forecasters at Space Weather Prediction Center at NOAA. Neel Savani is Research Faculty in Space Weather at University of Maryland, Baltimore County.